Held in Dubai, the forum is part of an ongoing series of Global Women’s Leadership events. 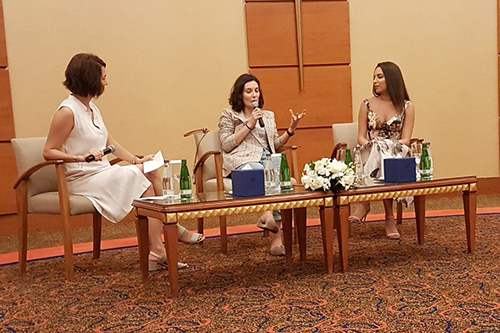 Esra Baykal, 2017 Dubai EMBA Coca-Cola Global Women’s Leadership Scholar moderated a panel discussion entitled Women entrepreneurs in MENA: Being your own boss and creating a successful brand, in Dubai on Wednesday, 7 November. Hosted by the Cass Global Women’s Leadership Programme, the talk brought together more than 35 delegates and featured Priscilla Elora Sharuk, co-founder and Chief Operating Officer of cybersecurity company, Myki; and City alumna Zara Martirosyan, co-founder of inKin, a social fitness platform for friends, family and co-workers to get fit together. The engaging talk saw the two speakers reflect on their entrepreneurial journey in the Middle East, and answer questions from the delegates about the opportunities and challenges related to launching and running a viable business. The Cass Global Women’s Leadership Programme, in partnership with The Coca-Cola Foundation, equips MBA scholars with insights and skills to become authentic leaders of tomorrow. Click here for more information about this innovative initiative.